A Ralph Sampson personal appearance, Ralph Sampson speaking engagement, or Ralph Sampson endorsement will reflect well on your company. To hire Ralph Sampson now for any corporate appearance, fundraiser, motivational speaker event, personal appearance, autograph signing, or website endorsement please contact our celebrity agents at 1-877-6-SPORTS. We will contact Ralph Sampson or contact Ralph Sampson's agent and provide you with the booking fees and availability immediately upon your request. Direct Sportslink is the only sports speakers bureau and talent booking agency based in the United States securing only sports talent for corporations, associations, and organizations for motivational speaking engagements, personal appearances, and endorsements. We are the premier sports celebrity booking agency and a sports celebrity procurement expert. Accordingly, we will provide you with any relevant Ralph Sampson website information and booking agent details so that you can hire Ralph Sampson for your next event. Sampson was arguably the most heavily recruited college and professional basketball prospect of his generation appearing on the cover of Sports Illustrated an unprecedented six times in a span of less than four years. Playing center for the University of Virginia, he led the Cavaliers to an NIT title in 1980, an NCAA Final Four appearance in 1981 and an NCAA elite 8 appearance in 1983. He earned three Naismith Awards as the National Player of the Year, only the second athlete to do so, and an unprecedented pair of Wooden Awards. The Houston Rockets made him the No. 1 pick in the 1983 NBA Draft. As a rookie he averaged 21.0 points and 11.1 rebounds, played in the All-Star Game, and won the NBA Rookie of the Year Award. Sampson had his best individual campaign during the 1984-1985, averaging 22.1 points and 10.4 rebounds and earning a berth on the All-NBA Second Team. He played in the 1985 NBA All-Star Game, and Sampson, after scoring 24 points and grabbing 10 rebounds, earned the game’s MVP Award. The next season Houston won the Midwest Division with a 51-31 record. In the playoffs, the Rockets swept the Sacramento Kings, but faced a stiffer challenge against the Denver Nuggets in the Conference Semi-Finals, eventually winning the series 4-2, with the sixth and deciding game going to double overtime. Against the defending champion Lakers in the Conference Finals, the Rockets were ready to knock off their rivals who had the best of them during the season. The Rockets lost game 1, but the Rockets fought back, winning four straight to take the series four games to one. In Game 5 of that series, Sampson provided one of the most memorable moments in NBA Playoff history. With the score tied at 112 and with only one second remaining on the clock, Sampson took an inbounds pass and launched a twisting turnaround jumper that sailed through the hoop at the buzzer, giving the Rockets a 114-112 victory and a shocking series upset. The Rockets would eventually lose to the Celtics in the Finals. Over the next four years, injuries plagued Sampson as he moved around to the Warriors, Kings, and Bullets and lead him to retire from the NBA in 1991. In 1996, Sampson was inducted into the Virginia Sports Hall of Fame. In 2002, he was named to the ACC 50th Anniversary men's basketball team as one of the fifty best players in Atlantic Coast Conference history - one of only three Virginia Cavaliers so honored. 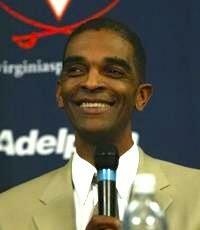 On November 22, 2011, Sampson was inducted into the National Collegiate Basketball Hall of Fame. 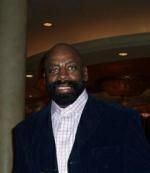 In February 2012, Sampson was honored by the Houston Rockets and fans as a member of the Decade Team of the 80s. 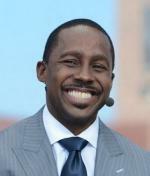 On April 2, 2012, Sampson was named a member of the Naismith Memorial Basketball Hall of Fame's induction class of 2012. Based on your interest in Ralph Sampson as a speaker or for a personal appearance, Direct Sportslink has provided you additional links below for other sports talent with similar appearance fees, speaker topics, and categories that match Ralph Sampson.